Now in its fourth generation, the Inova T4 is an advanced lithium-ion powered flashlight that has gone through several updates and revisions, with the latest 2011 model (T4QM-HB, identifiable by a “D” in the serial number) introducing a new LED for increased brightness, as well as an additional 94-lumen medium mode. 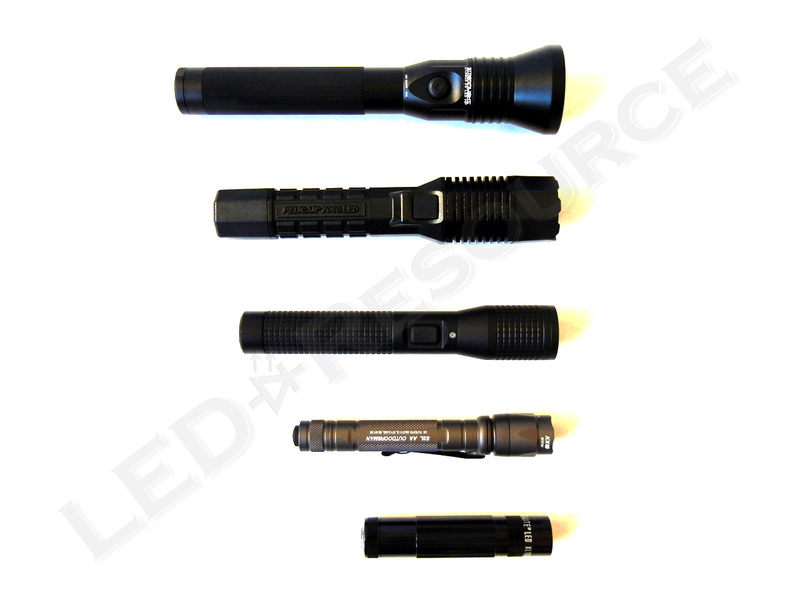 One of the smallest lights in the mid-sized rechargeable flashlight category, the T4 packs a lot of power and functionality for its size. Weight with Batteries: 9.07 oz. 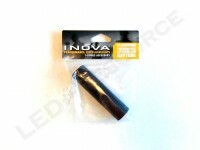 MSRP for the Inova T4 is $149.99, and the light is only available in black. Many retailers sell the T4 for around $110. 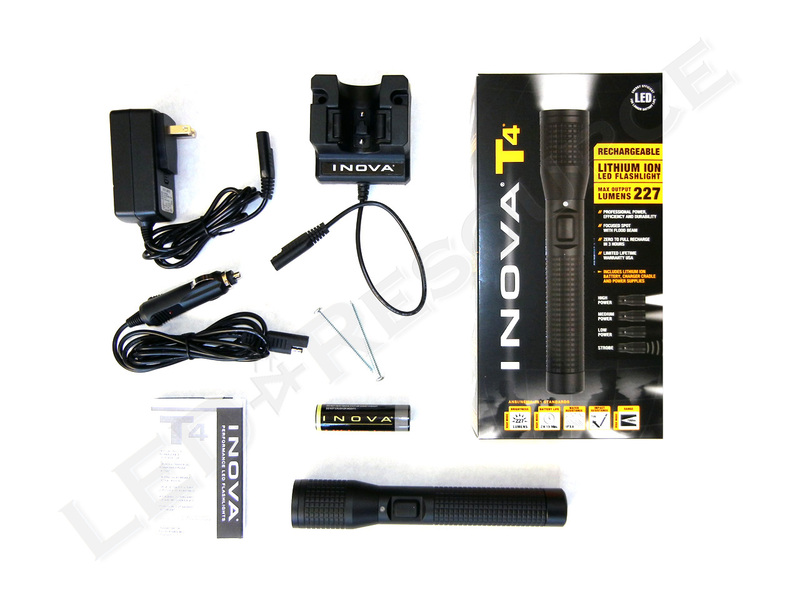 Included in the box are: Inova T4, Li-Ion rechargeable battery, charging cradle, 2 x mounting screws, AC adapter, cigarette lighter adapter, and user manual. A nice touch here is that every component is neatly packaged in either a box or a bag, with a label indicating what is inside (not shown above). 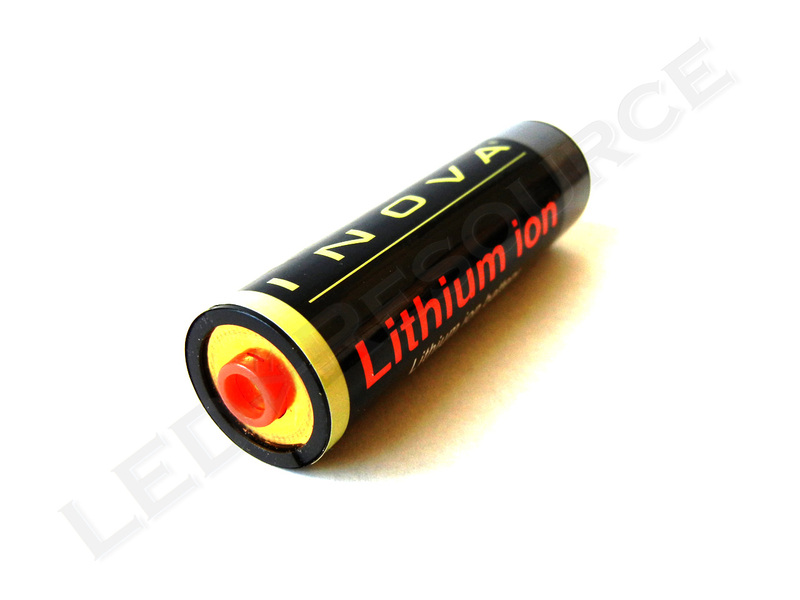 A proprietary rechargeable 2150mAh lithium-ion battery powers the Inova T4. 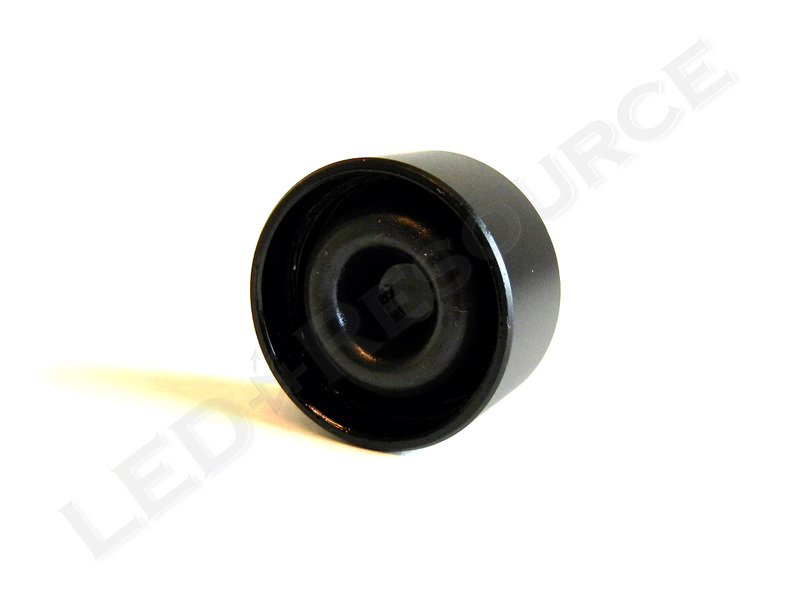 To charge the light, insert the light into the charger and pull down on the light to ensure alignment of the grooves on the light and charger. All of the charging circuitry is contained inside the flashlight, which has an LED indicator for charge status. A solid red LED indicates charging, and solid green indicates a full charge. 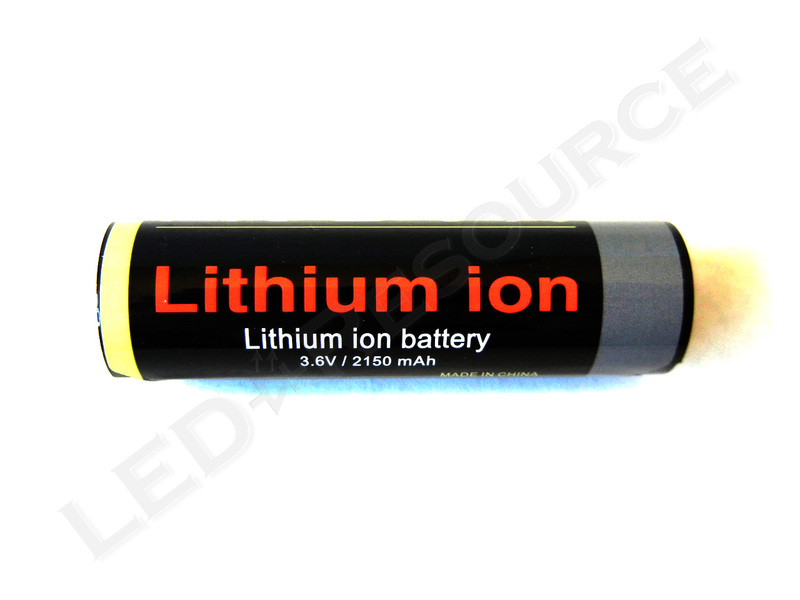 A fully discharged battery can be recharged in about 3 hours, and leaving the light in the charger won’t overcharge the battery. The head features an anti-reflective coated glass window and an aluminum reflector with a slightly textured “orange-peel” type surface. The uneven surface on the reflector removes artifacts from the beam, creating a wider, more uniform beam pattern. 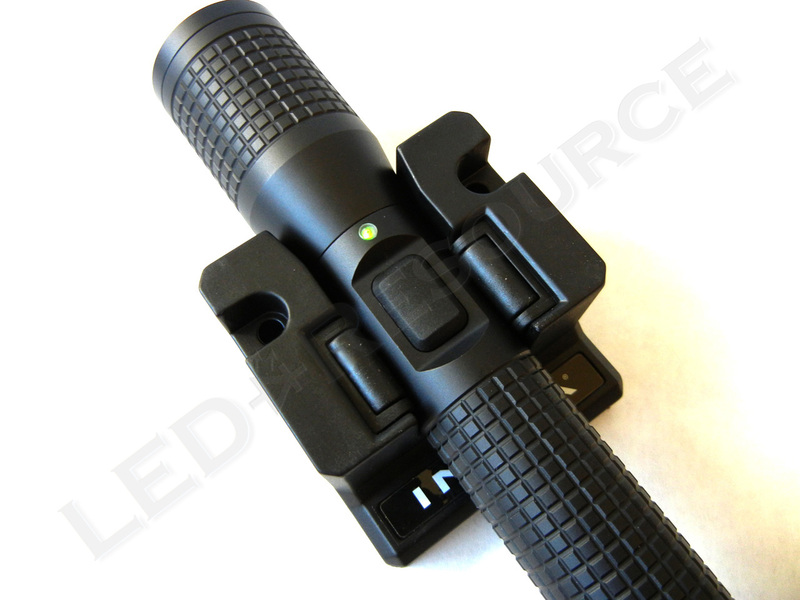 The light is type-III anodized (hard anodize) aluminum. Hard anodize is the most durable aluminum finish, nearing the hardness of diamond. The switch is located mid-body below the charging LED, and gives good audible and tactile feedback with a solid click. 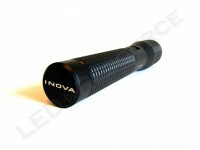 The switch was changed in the fourth version of the Inova T4 to a stiffer, more durable one, and due to the small diameter of the body, it tends to be more difficult to activate with an index finger. 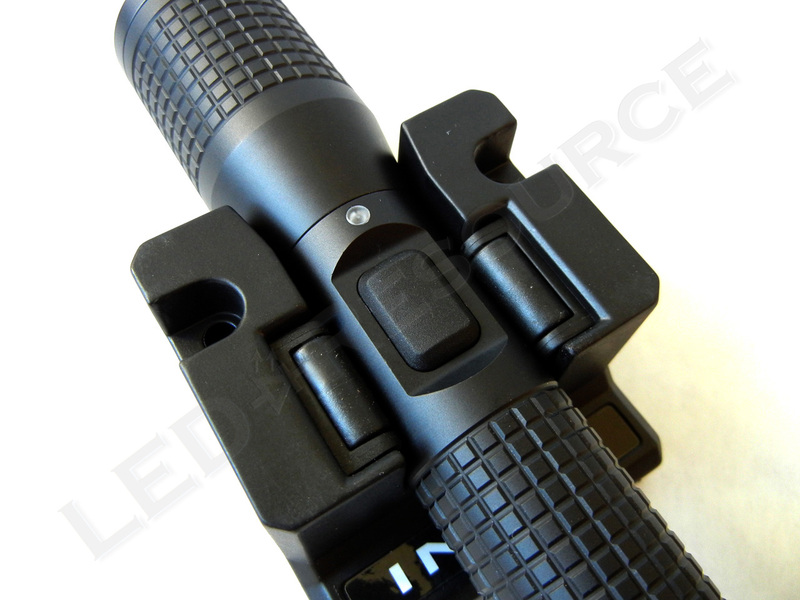 Both the head and body feature a checkered knurling pattern, making it easy to maintain a good grip regardless of which way the light is held. The tail cap of the Inova T4 does not serve any electrical purpose, as it only contains a rubber bumper that pushes the battery firmly in place. An easy way to spot the latest revision of the T4 is by the newly-added Inova logo on the back of the tail cap. A single click activates maximum brightness of 227 lumens, for a runtime of 2h 15m. When high mode is activated and the switch is clicked within two seconds, the 94 lumen medium mode is activated (note that if clicks are too fast, strobe will be activated). The T4 has a runtime of six hours on medium. 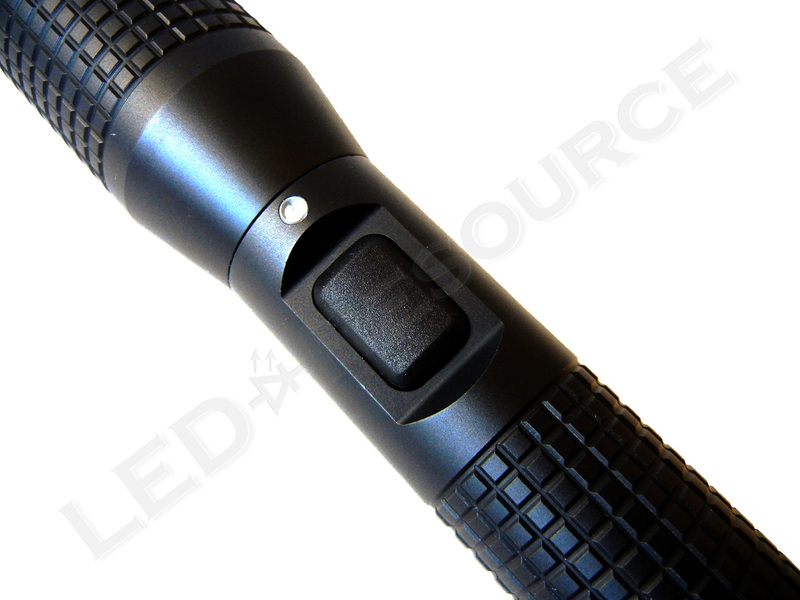 When medium mode is activated and within two seconds from activating high mode, the 16 lumen low mode will be activated if the switch is clicked once more. 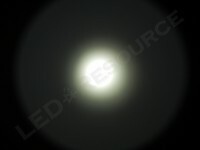 The light has a runtime of 48h 30m on low. When the switch is held for more than half a second, the light will turn off when the switch is released. A slightly annoying bug that we found with the momentary on mode is that the next time high mode is activated, the light will flash once. 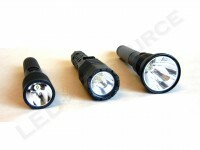 Two fast clicks at any time will activate the strobe. For all modes, a single click will turn the light off if the two second time limit has passed. 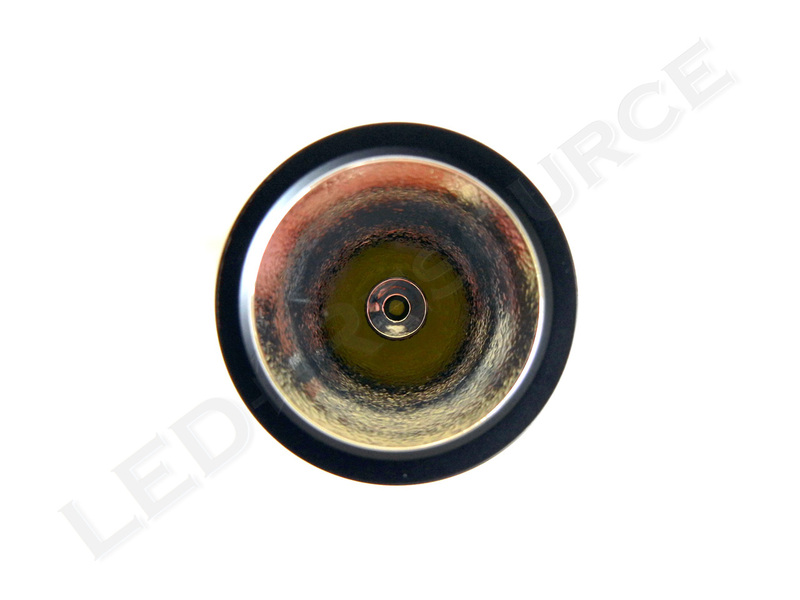 Since the light use an electronic switch, there is a small standby current drain of less than 7.5μA. 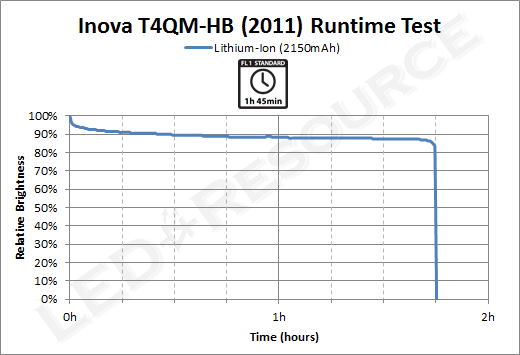 The Inova T4’s performance is in line with the average mid-sized rechargeable flashlight, with slightly more output and runtime than the competition due to the more efficient Cree XP-G LED. The beam is smooth and contains a larger hotspot in the middle due to the orange peel reflector. 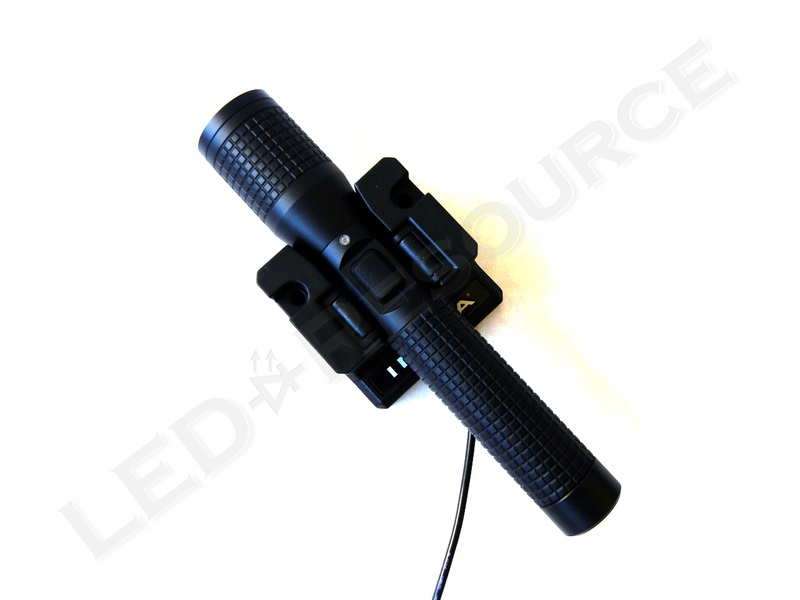 The wide hotspot allows for more peripheral illumination, which is particularly useful for close-up work. 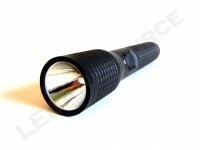 The aluminum body of the flashlight acts as a heat sink, and can get moderately warm during extended use. 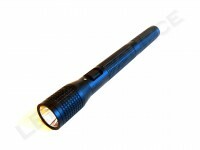 The T4 maintains steady output, even as battery charge is getting low, so the light features a low battery warning in the form of rapid flashing. 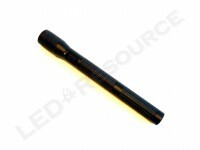 We barely noticed this flashing because it was very rapid and only lasted for around 15 seconds, so it would be recommended to keep the batteries “topped-off” to prevent unexpected battery exhaustion during use. A charging cradle, AC adapter, and cigarette lighter adapter is included with the Inova T4. 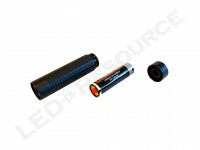 This add-on, which can be purchased for $39.99 and includes a spare battery, replaces the tail cap on the T4 with a battery tube extension that houses a spare battery. The extension adds about 4″ to the T4’s length. 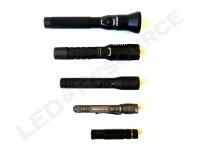 Additional charging cradles, AC or DC adapters, batteries, and traffic wands are also available for the T4. Small size and good performance characterize the Inova T4 rechargeable flashlight, and the T4 has a smooth beam pattern and a durable type III anodized finish. 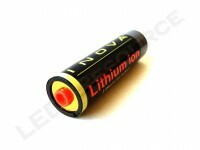 However, it’s the unique and practical optional spare battery holder that makes the Inova T4 stand out! Thus makin a better contact ! !